Between nightmare-inducing memories of jumpers shrunk to Chihuahua size and recent reports of fire hazards, finding the best tumble dryer can be a daunting task. But, as this handy guide to the best tumble dryers proves, that doesn't have to be the case. 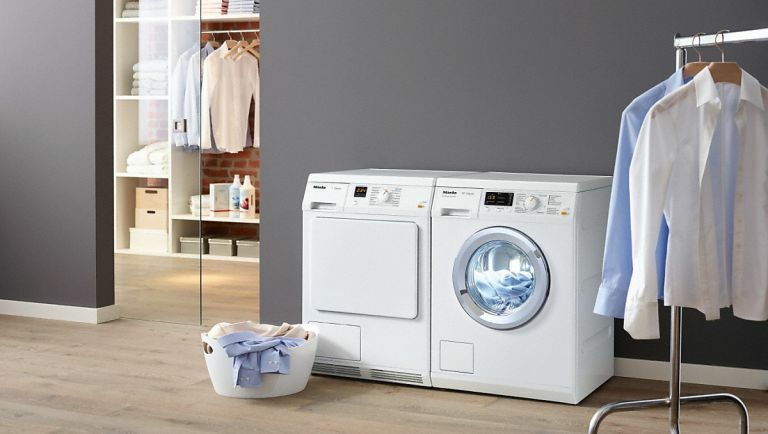 Once you've browsed our pick of the best tumble dryers, take a look at our guide to how to buy a washing machine and tumble dryer for more specific buying advice. Then, find more advice and inspiration for other household essentials over on our appliances hub page. When it comes to the best tumble dryer, our top recommendation comes in the form of the Bosch WTW87560GB Heat Pump Condenser Tumble Dryer, which offers everything you could need in a tumble dryer for a very affordable price. A handy heat pump means this model if far more economical than many of its competitors, as proven by its A++ energy rating. On top of this, it's self-cleaning and has a large load capacity, which is perfect for larger households. Before you buy, you’ll need to know a little of the lingo, and that includes what type of tumble dryer you should buy for your particular needs. It used to be that tumble dryers were hugely frowned upon for being outrageous energy guzzlers but things have improved greatly and the latest designs are energy efficient and super effective. First, there are vented dryers, which take damp air from the drum and pump it out of the machine, and can either attach to a wall vent or be used in a room with the window open. These are usually on the cheaper end of the scale. Then, there are condenser tumble dryers, which remove the water vapour from the drum and deposit it as liquid into a separate tank, meaning they can be installed anywhere, but will usually cost more in the first instance. Finally, there are heat pump dryers, which recycle and reuse the warm air to dry clothes, and while they’ll cost more again to buy, they can cut down immensely on running costs. Vented models are pretty outdated now, so most dryers on the market are condensers, with a drawer that collects the water and simply needs to be emptied when it’s full. This is great, as it means you can site the dryer anywhere there’s a plug, without having to hang a ducting hose out the window. For lower energy consumption, a condenser with heat pump technology passes hot, humid air through a heat pump and re-uses it, resulting in 50 per cent less energy use. Check out the capacity and make sure it has at least the same kg drum as your washing machine. The larger the drum, the better the air flow and the faster the drying time. There’s less creasing, too. It’s worth paying more for added benefits such as sensor drying, which reduces the need for ironing, crease care, cool air settings and final cool tumble. Measure up the space you’ve allocated for the new machine and check dimensions of the product you’re interested in carefully. A few mm can make all the difference. If you’re undecided, based on our advice above, as to which type of dryer is right for you, this Bosch tumble dryer looks to be an ideal middle ground, so long as there’s room in the budget. Its heat pump makes it far more economical than a conventional condenser dryer, as attested to by its A++ energy rating, but it may also be economical in terms of saving you time, as its condenser system is self-cleaning, automatically rinsing away fluff for a very clean and efficient machine. But it really earns our top spot with its large load capacity, up to 9kg, a great insurance policy for particularly heavy laundry days or bigger households. In our opinion, this is the very best tumble dryer you can buy. With an impressive A+++ energy rating, and heat pump technology to constantly recycle air inside the drum, this Samsung model is the most efficient tumble dryer on our list, and also easily the most expensive. If you can afford the initial outlay though, it’ll save you lots of pennies and energy in the long run, thanks to that clever wasteless system. But perhaps its biggest value, and the one that sets it apart from our Bosch pick, lies in its talents as a “smart” appliance. Using the Samsung Smart Washer app from an Android or Apple device, you can choose the drying programme and check on your wash’s progress even if you’re not home. At first glance, some may not be a fan of the vaguely old fashioned design with its opaque door that means you can’t keep an eye on your load as it dries, but this Miele dryer proves it’s what’s on the inside that counts. Reviewers loved how quickly it dried loads with which previous dryers had struggled, and found it simple to operate despite ample settings to meet most drying needs. We particularly like the sound of the honeycomb drum, which is designed to form a film of air around the fabric to protect and extend the life of your clothes, but by far the most glamorous feature is FragranceDos, whereby you can add one of Miele’s five specially formulated scents to the load for great-smelling laundry. Our top pick of the best tumble dryer if you're after a condenser. If your household is small and your dryer use not too frequent, the Hotpoint Aquarius TVFS73BGP is the best tumble dryer for you. As a vented model, it’s not as efficient as a heat pump or even a condenser tumble dryer, but if you tend to dry smaller loads, or only dry less high-maintenance items like bedding or towels, it shouldn’t make too much of a dent. Some reviewers found the pre-programmed modes, as opposed to setting their own temperatures, to take a little getting used to, but overall found it simple to use and, crucially, very quiet. Its high praise and small price make it our best pick for first-time buyers, or anyone who’d like a great value dryer for occasional use. Combining a reasonable price with a decent energy rating and a decidedly above-decent load capacity, this Zanussi model is our best tumble dryer for value. At a slightly higher price point than the Hotpoint Aquarius, it may not be the natural first choice if it’s your first time buying white goods and you have a rigid budget, but as a condenser model, it will end up saving more money in the long run, and is more suitable for bigger households thanks to its ability to dry up to 8kg of laundry in one go. And, as its reviewers commented positively on the ease of use and cleaning, as well as its extra dry mode to eliminate guesswork, it seems it might save busy families those extra few minutes, too. Looking for more advice on washing and laundry?